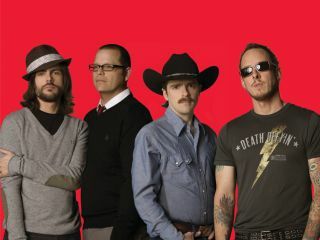 Weezer are returning to the studio in November to record the follow-up to 2008's self-titled 'Red Album'. Split rumours back in 2006 left many fans wondering if the band would ever record together again. Now it seems that a newly-collaborative writing process is the key to the band's new-found creative exuberance. Drummer Pat Wilson told Billboard that just like their sixth studio album, LP number seven - the band's last under contract to DGC - will see all four members writing, switching instruments and sharing lead vocals. "Now that we've got more writers, we don't have to wait for (frontman) Rivers (Cuomo) to have a bunch of songs he's happy with," Wilson explains. "We used to take forever to make a record, then tour on it forever and be burnt out and not do anything for two years. This is a lot better." Whether or not the results are better in terms of the actual quality of the songwriting is another question. This year's 'Red' was a patchy affair, although it did yield an excellent return to the old-school Weezer sound in the form of Pork And Beans, and the amazing Pig, unfathomably relegated to mere bonus track status. Tellingly, both were penned by Rivers Cuomo. Album number seven will see the band reunite with producer Jacknife Lee (REM, Bloc Party) who contributed to 'Red': "We send him stuff that we've got, ideas that we have, and whether it's a whole song or a killer riff we can build around or something," Wilson says. "A week after we get off tour, we're gonna [join him] in the studio." As for its title? Expect a colour once again: "If I had my way we would just use colours from now on," says Wilson. "Then we wouldn't have to think about titles."